The name Dard Hunter has become synonymous with handmade paper as an art form. Hunter spent his life researching techniques that had almost become lost and writing about his discoveries. His expertise was not limited to paper but encompassed the entire scope of bookmaking, type design, type cutting, casting and printing. Vojtech Preissig was a Czech artist with strikingly similar aspirations and sensibilities to those of Hunter. Although his work is less widely known, Preissig was prolific and dedicated to the book arts to the point of self-sacrifice. 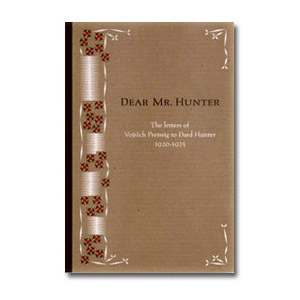 In 1920 Vojtech Preissig contacted Dard Hunter to inquire about having a custom handmade paper produced for a book project. This initial contact led to a lengthy correspondence and friendship that demonstrated a shared passion for all aspects of the book arts. 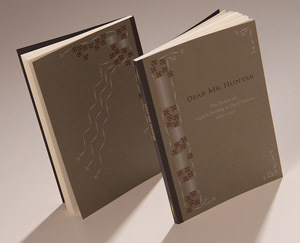 Dear Mr. Hunter comprises Preissig's letters to Dard Hunter. The ultimate fate of Dard Hunter's letters in reply is unknown, but Preissig's side of the correspondence offers many insights in its matter-of-fact unveiling of the process of artistic development. The book includes illustrations of Preissig's work, an introduction by Timothy Conroy, and a foreword by Richard Kegler. Printed in an edition of 1000 copies. Unbound signatures for hand binding are available at $9.95.